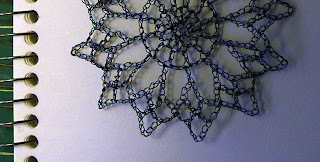 Traditional doily pattern in blue coated copper wire. 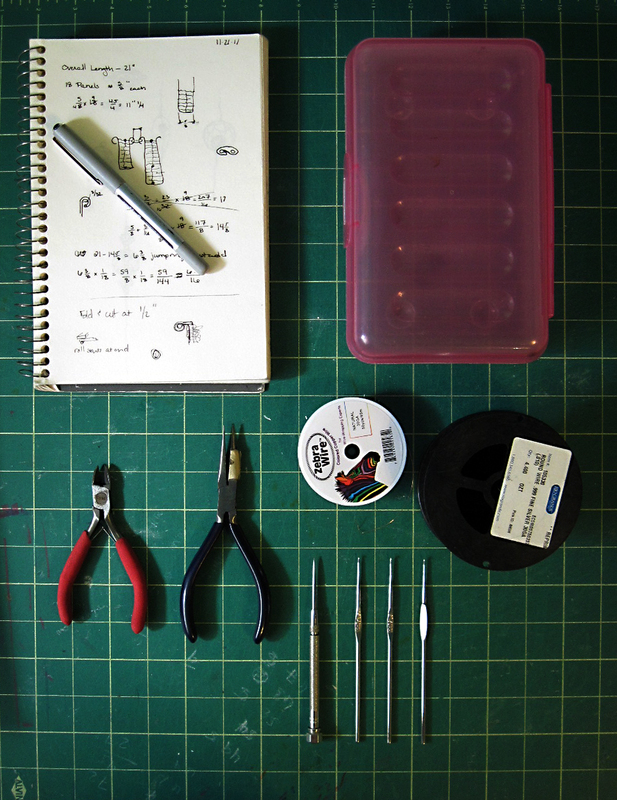 Before starting on the actual crocheting, we need to talk about tools and materials. One of the great things about crocheting in metal is that you can do it just about anywhere. All of your tools and materials will fit nicely into a pencil box; you can just throw it into your bag and create on the go. 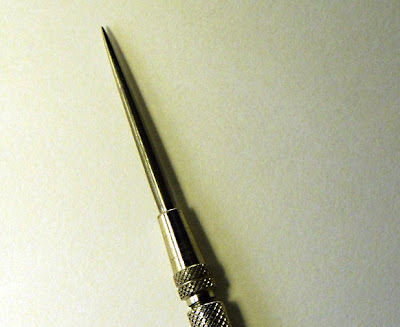 You don’t need many tools to get started and they aren’t expensive or hard to find. There is a concise list of supplies and sources at the end of this post. The first thing you will need are crochet hooks. I use steel hooks for crocheting metal (the colorful aluminum ones are way too big). 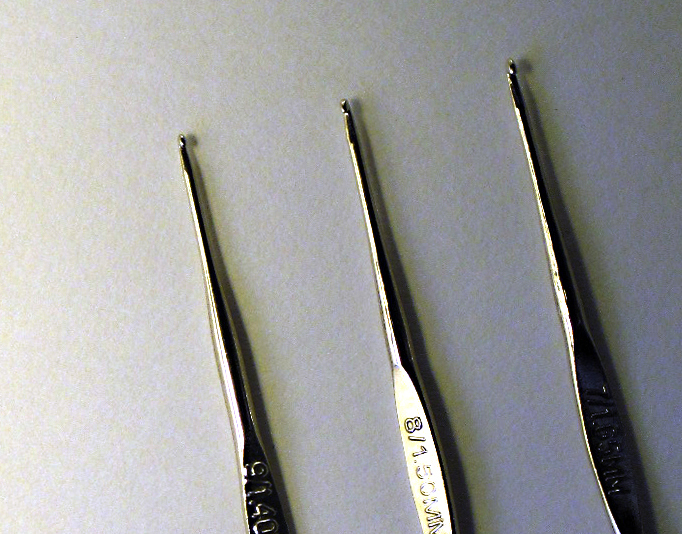 I strongly recommend sizes 7, 8, and 9 (1.65, 1.50, 1.40mm) to start. I know, I know, they are tiny; your wire will also be tiny so it all works out. 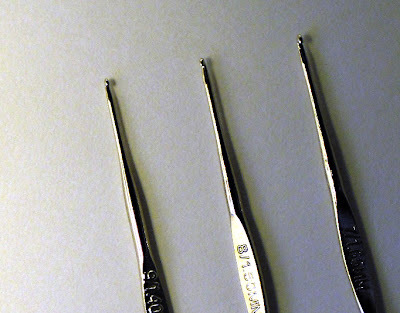 Pictured are 7, 8, and 9 hooks. Notice that the hooks get smaller as the numbers get bigger. You can purchase these at any craft store that carries knitting supplies and some big-box retailers. If you already own some hooks, just use those. You don’t need a new set just for metal. I use mine for both metal and thread. You will also need wire. Most of my finished work is done in fine silver (which is pure silver) but I use copper for samples. I recommend that you start with copper because you will need lots of practice and shouldn’t worry about messing up. The gauge of your wire is very important; gauge refers to the thickness of the wire. I use 30 gauge for most of my work. All demonstrations and explanations will be with 30 gauge (.254 mm) wire. If you just can’t find 30, 32 gauge is okay. Just like with the hooks, the wire gets smaller as the number gets bigger. Therefore, 32 gauge wire is thinner than 30 gauge. Don’t go thicker than 30 gauge. Thick wire is really hard to work with and you will end up with wicked blisters and callouses on your fingers. The metal is important, as well. Use copper for crocheting. Brass and sterling silver get hard and brittle as you work and make life difficult. It’s fine if the copper has a color coating on the outside as long as it’s copper on the inside. Look carefully at a cut end for copper color, if you aren’t sure. 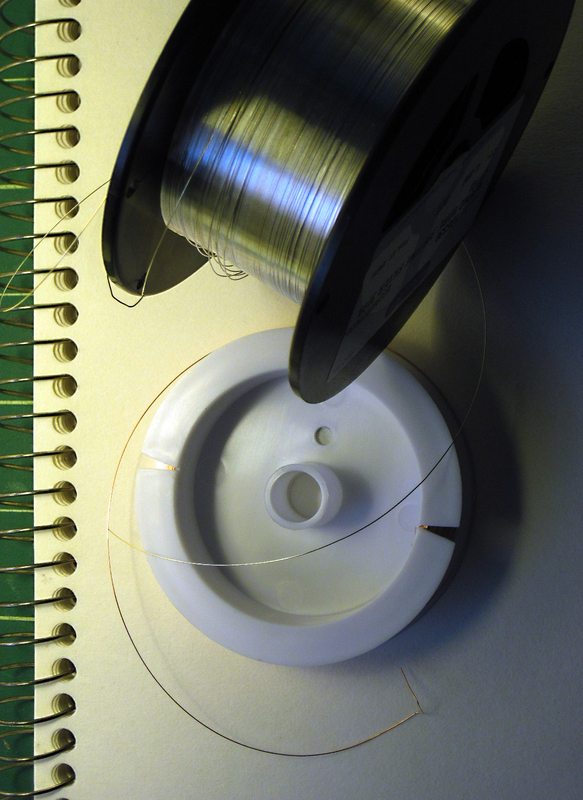 Wire is sold in spools and coils. Be sure to get spooled wire. Untangling coiled wire is time consuming and hardens the wire. I order my 30 gauge copper from Fire Mountain Gems and my fine silver from Rio Grande. The craft stores only seem to carry 32 gauge in my area. Since I am usually working toward a design in silver, I like to use the same gauge in my samples that I will use on the finished piece. 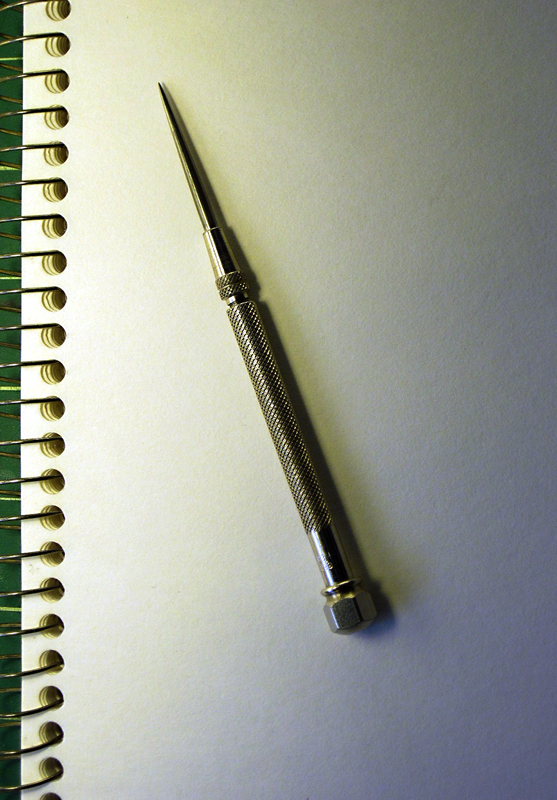 You will also need a scribe for crocheting in wire. If you are used to working in yarn, this will be a new tool for you. It is very, very useful. Mine is a pocket scribe that can be closed up for safe carrying. 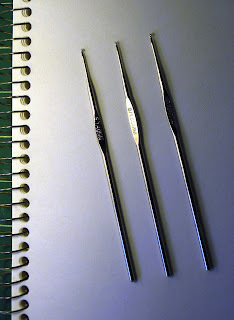 Your scribe should be fairly sharp with a gradual taper. I have used mine from the beginning and find it essential in the process (so much so that I have two and I rarely buy two of the same tool). I poked around for some reasonable substitutes but a #0 knitting needle isn’t sharp enough and a #20 tapestry needle doesn’t get fat enough. So, get yourself a scribe. I bought one at the local hardware store (Elliot’s) and one at an art supply store that sells jewelry tools. If you go to the hardware store, take the picture with you. It will make your life much less complicated. Regarding the hardware store: the small local one is more likely to have it; I haven’t had much luck finding them at the big-box stores. If you prefer to shop online, just google “pocket scribe”. A pair of wire cutters is essential. 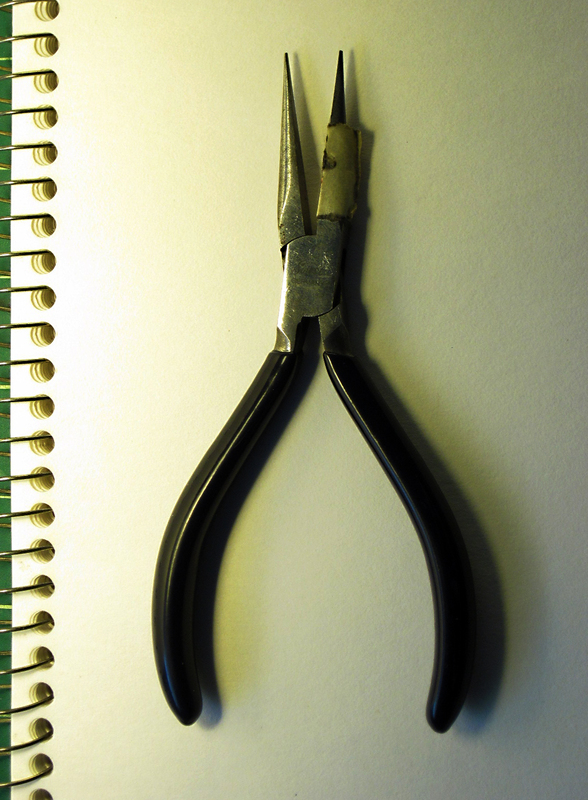 After all, you are going to need to cut the wire at some point and using scissors will wear out the edge quickly. The little, palm sized ones are just fine. 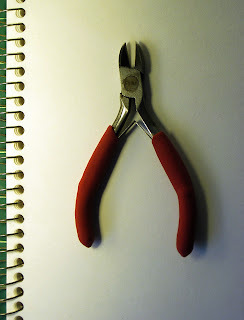 If you have to get a pair of pliers, you can just pick up a set that includes pliers and cutters. Diagonal cutters are better than end cutters for this application but either will work in a pinch. You can get these at any hardware store. You will need a pair of pliers for grabbing hold of tiny wire ends and tying things off. Needle nose or long chain nose pliers are ideally suited for this purpose. Regular chain nose pliers are okay. Make sure the pliers have smooth jaws. Serrated jaws are less precise and mar the wire, making it itchy and uncomfortable. You can also pick these up at the hardware store. I keep everything together in my happy pink pencil box. It all fits nicely in there but be sure to wrap your pliers and hooks in a piece of cloth to protect them from scratching each other. I also have a sketchbook where I write down notes, patterns, and design ideas. 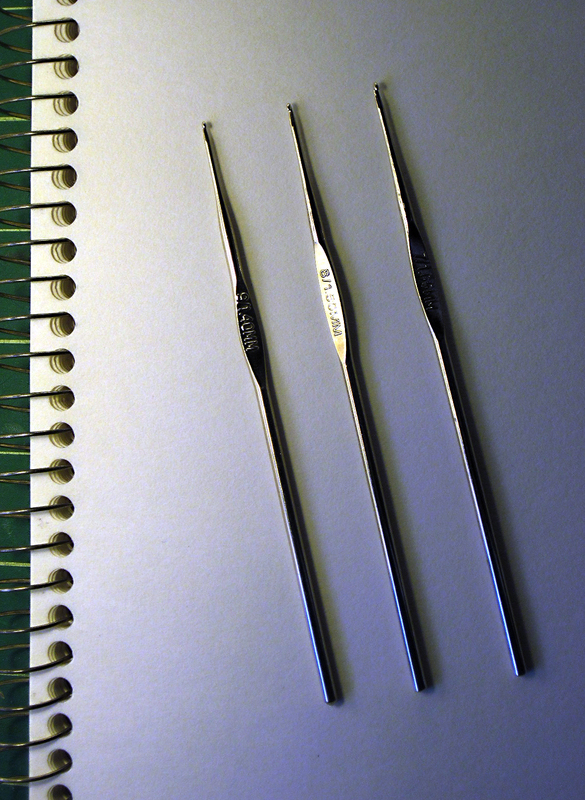 It is really useful to jot down what size hook and wire you used to make a particular sample. Protect your pliers and only use them on non-ferrous metals (no steel!). You want to keep the plier faces nice and smooth. They are definitely not for pulling that evasive nail out of the wall. Don’t let your tools get wet. Ever. They will rust and you will be sad. Don’t unroll and re-roll your wire or pull on it unnecessarily. The less it moves, the easier it is to work. Don’t drop your spool of wire. Aside from the frustrating tangle that inevitably results, this hardens the wire and makes it prone to breaking and difficult to work with. Take good care of all of your tools. They are a lifetime investment. So, that’s all for today. Go get your tools and come back next week for Lesson 2: Chain Stitch. Let me know if you have any questions in the comments section below. Thanks for sharing! Could be useful in steel suppliers philippines. The Making of "Float: Cirrus"
Pink and Orange, Boxes and Cheese?